Can be ordered with 2 steam wands and 2 hot water valves or 3 steam wands and 1 hot water valve (specify in comments when ordering). For a dramatic effect, additional options can include hammered copper sides, oval finished sides, and a dome in copper, brass, or stainless steel. Shown in optional stainless frame and stainless panels. Standard with black frame and your choice of several panel colors. 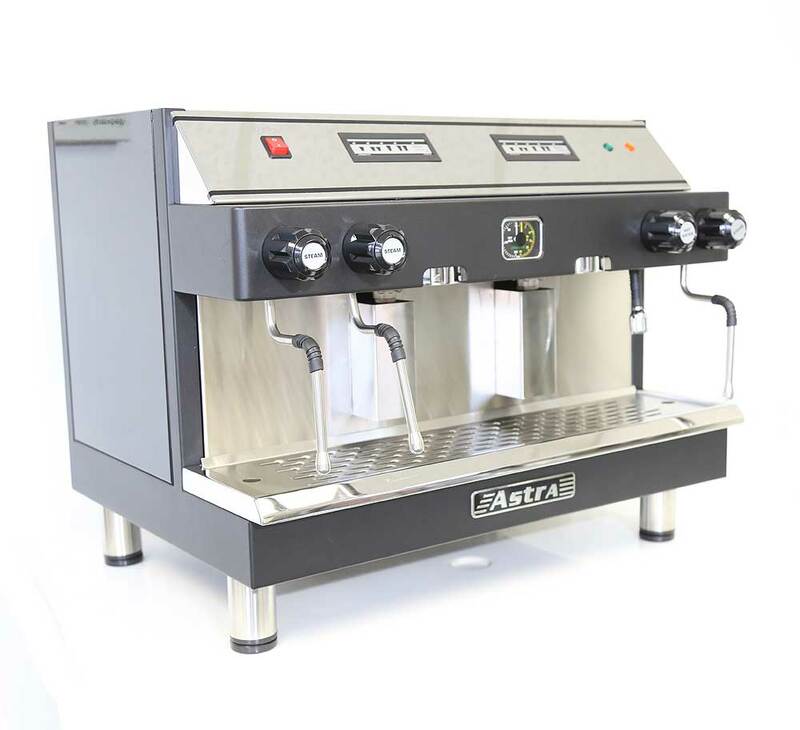 The Astra Mega II Commercial Espresso Machine is a deluxe full size two group espresso machine. Standard with three steam wands and one hot water tap. 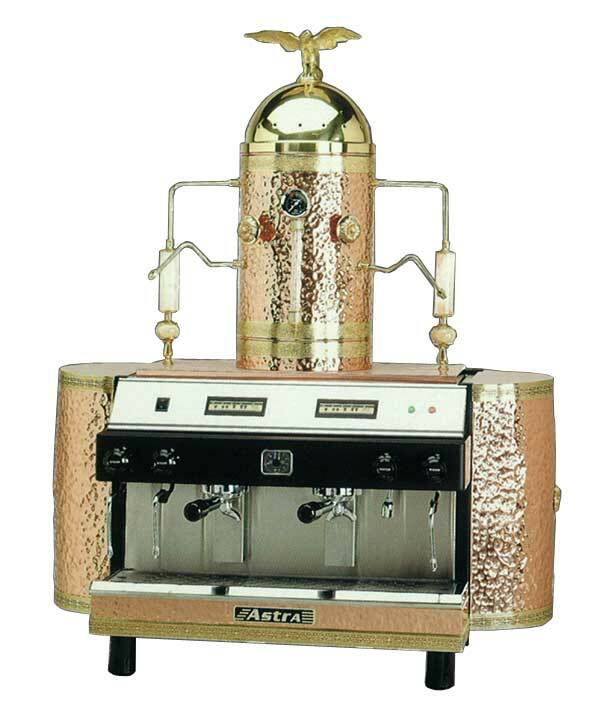 The perfect choice for busy coffee houses because of its high production capacity of 480 cups per hour. 220V. Standard equipped with 3 steam wands and 1 hot water valve. Other panel colors available. Extra large boiler and heating element for busy coffee houses. 20"H x 19.5"D x 27.25"W. 4500 watts. 12.5L boiler. Available with Black, Red, Silvertone, Coppertone or Blue Panels. Includes 3 portafilters (2 double, 1 single), a blank filter, flexible drain hose, and cleaning brush. 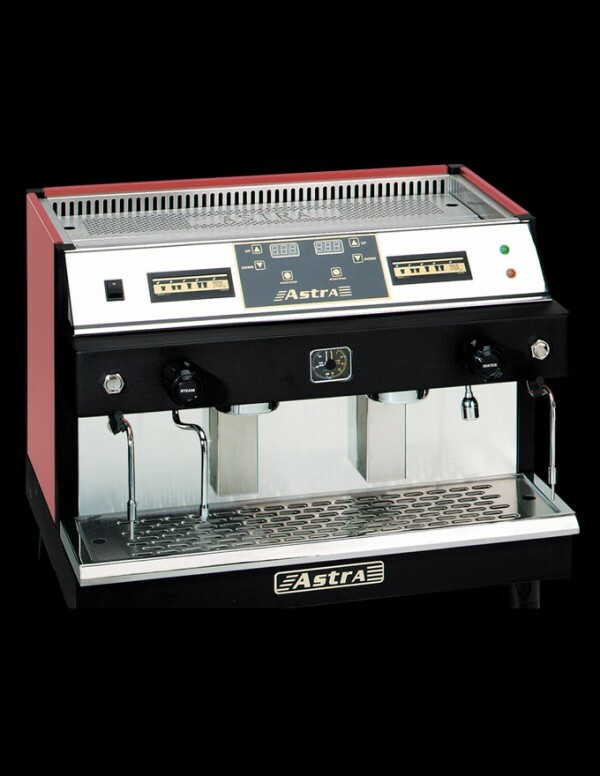 Astra espresso machines feature a microprocessor-controlled diagnostic system for quick troubleshooting. Nickel-Plated copper boiler with lifetime warranty. Internal oversized power breaker for added safety. Brewing system with thermo-circulation and infusion provides absolute temperature consistency and quality coffee. When machine is turned "on" the heating element will not go on unless there is enough water in the boiler. Vacuum valve to prevent milk from entering the boiler. Automatic water fill. Motor will shut off if no water reached the Procon pump. Modular construction makes Astra the easiest machine to service and maintain. No electrical switched below the machine to avoid risk and hazard. Internal quiet motor with rotary-vane Procon pump. All American brass flare fittings reduce future cost of service. Automatic low-water shut-off switch with reset. Two (2) year manufacturer's limited warranty on parts except gaskets, knobs, and all wear parts (unless factory defective). 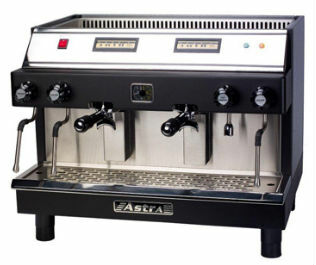 Astra is a leading manufacturer of espresso and cappuccino machines. Their name is synonymous with reliability, and their machines have achieved continuous acclaim for their superior engineering, quality, and simplicity. Each Astra machine utilizes aerospace engineering and other products that allow the machines to operate continuously for years without the need for expensive repair or maintenance. Astra offers unparalleled customer service and factory warranty. Replacement parts are available directly from the factory, and many are available at your local plumbing or hardware store. Additionally, the average user can perform most necessary repairs without facing extensive costs. What's more, they're made right here in the U.S.A.
A machine you can relax about and feel proud of. 1/4 inch flair beverage fitting is the standard connection, or you can use John Guys fittings 1/4 inch flair to 3/8 inch quick disconnect.